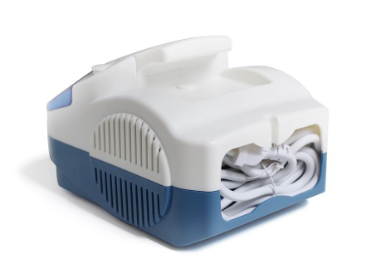 A nebulizer machine uses a compressor to make air travel under high pressure through liquid medicine and convert it into breathable mist by reducing its particle size. These compressor nebulizer machines are a great medical device for asthma patients who just need to breathe normally while using it and not take deep inspirations as in inhalers, which can become burdensome for an already compromised breathing capacity. High-quality compressor nebulizers are available on Ddu (Drugdu.com), the leading global pharmaceuticals and medical devices online B2B platform. One of them is the Compressor Nebulizer manufactured by Shenzhen Homed Medical Device Co., Ltd. This compressor nebulizer has an average nebulization rate of ≥0.25ml/min. It creates a noise of less than or equal to 55 dB at a distance of 1 meter. It has a maximum working pressure of ≥35 Psi. It is ideal for use in a hospital, clinic, an atomizer room, a nursing home, or for personal home care.